The Beauty of Pearl Embossing Paste. Want to add detail but don’t know how? Let me enlighten you. 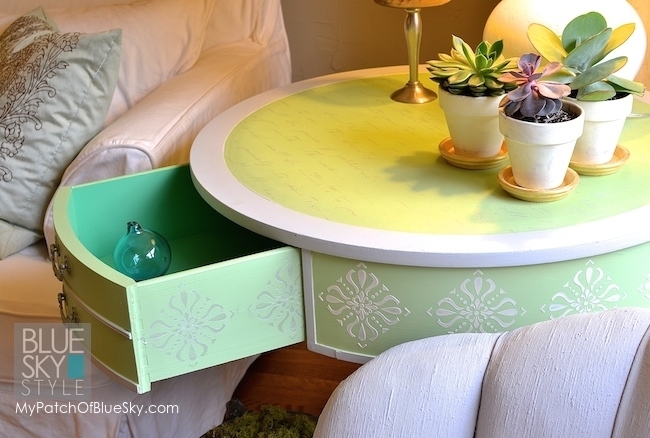 If you love painting furniture or have been glued to Pinterest at any time in the past few years, you will have seen some amazing furniture transformations and updates. One of the most beautiful, and incredibly simple, things you can do to an item to create interest is to ‘Emboss’ it. Just look at this stunning table created for us by the lovely Debbie Hayes of My Patch of Blue Sky. Oh yes, you can do it! It does that sound kind of daunting, doesn’t it? A little bit advanced? Something that you need training and years of practice to be able to achieve? Guess what, it is super easy, and all you need is our Smooth Embossing Paste! Debbie has a great tutorial on just how she achieved this look right here. 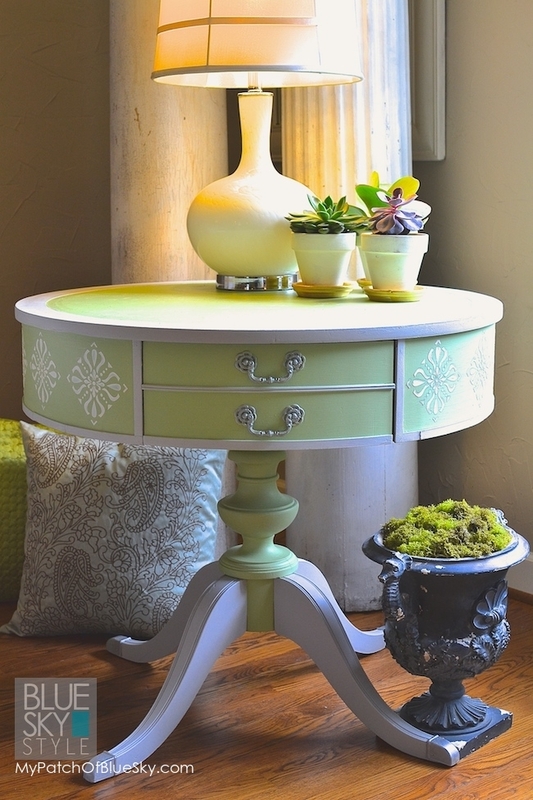 Just look at this stunner from Sharon at I Restore Stuff – beautiful! Be sure to check out her blog – she even has a great video, full of tips, for you to watch! The pattern you see behind the drawer pulls? Can you believe that takes just a few minutes and I think it takes the piece from nice, to simply spectacular. 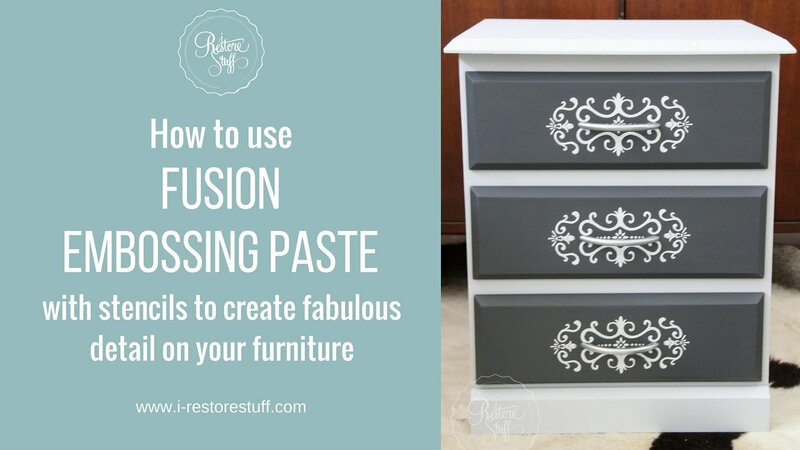 There are many looks you can achieve with the embossing paste – from a craft project or wall canvas to a complete dresser or set of kitchen cabinets. Take a look at our Stencil Blog for some extra tips and information. Start simple and once you see how easy it is to use, be ready for a new addiction! 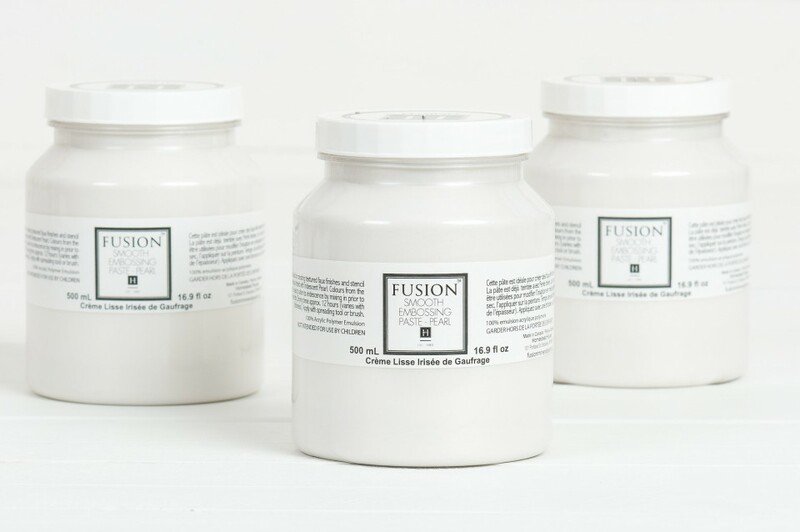 The best way to try our Smooth Embossing Paste is to go and see your local Fusion™ Mineral Paint Merchant. Many of them offer classes if you would like a guiding hand. I cannot encourage you enough to take a visit to your local Fusion Merchant and take a workshop or spend some time chatting with the experts! Fusion™ Pearl Smooth Embossing Paste is an acrylic based medium that has a thick consistency perfect for creating ridges and textures. 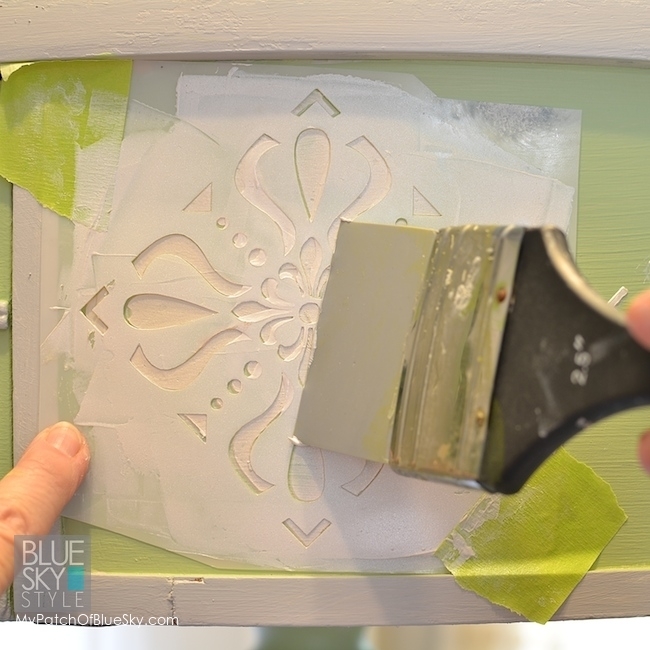 When used through a stencil you can get beautiful raised patterns! It will dry translucent with a pearl finish and can then be painted, waxed over to enhance your design. Fins out more about our awesome waxes here, in our Waxing Blog Post! You can easily create beautiful metallic finishes by adding our Metallic Paints to the paste, or add any colour to it for a customized look. Easily applied with a trowel or spatula the Smooth Embossing Paste will hold any texture that it is put into. You can even use a piping bag and create your own raised pattern – if you are a decorative baker, then I salute you – you will LOVE this stuff! Just remember to keep the bag for painting not baking! 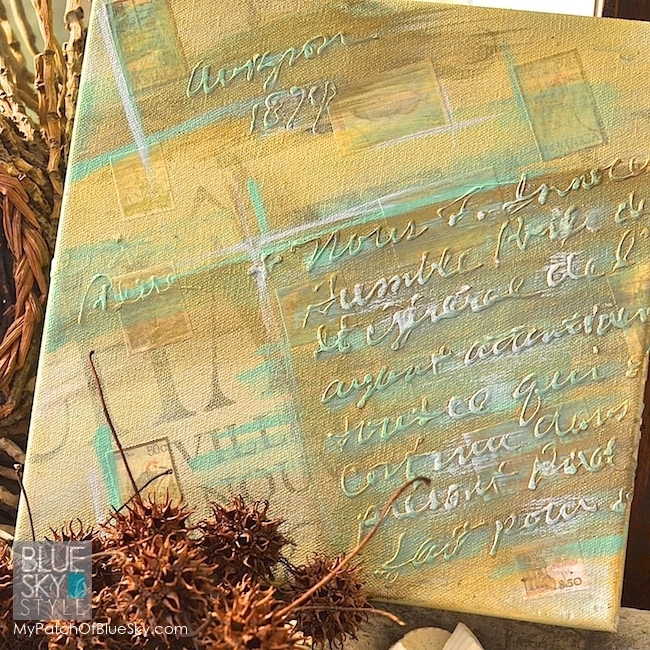 See how My Patch of Blue Sky used Fusion™ Smooth Embossing Paste, and some other Fusion™ Products to create beautiful art on Canvas! So my advice – jump right in. Go and see you local Fusion™ Merchant and either book a workshop or treat yourself to a pot of loveliness that is SmoothEmbossing Paste – Pearl.